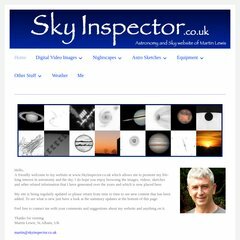 Topics: Webcam Images Iss & Shuttle, Mars & Venus, Jupiter, Saturn, and Comparison Images. On average 3.00 pages are viewed each, by the estimated 40 daily visitors. Mr Site Ltd (England, London) is the location of the Microsoft-IIS/7 server. ns16.hosthost.co.uk, and ns17.hosthost.co.uk are its DNS Nameservers. Skyinspector.co.uk's IP address is 193.227.106.113. PING www. (193.227.106.113) 56(84) bytes of data.